How would you like an extra slick, smoother, ultra-thin top-grain leather on the outside of your super thin tri-fold? And yes we can, we can even make a tri-fold wallet extremely thin with our thin nylon-microfiber material doing all the work on the inside. And you Tri-Fold lovers know who you are and know what you want. No one is going to make you change wallet designs�you won�t part from your beloved double-fold-over that is thicker by design than other wallet out there. Yet you persist and you wore us out. So here's the Best of Both Worlds: super-thin top-grain leather on the outside and ultra-thin nylon microfiber on the inside. The Big Skinny tri-fold hybrid is 3-4 times thinner than your current leather, canvas, old-style nylon tri-fold wallet and about 5-7 times lighter. And our non-slip interior helps keep your cards and cash intact so you don�t even have to fold everything over to protect your �stuff� yet you will�why? 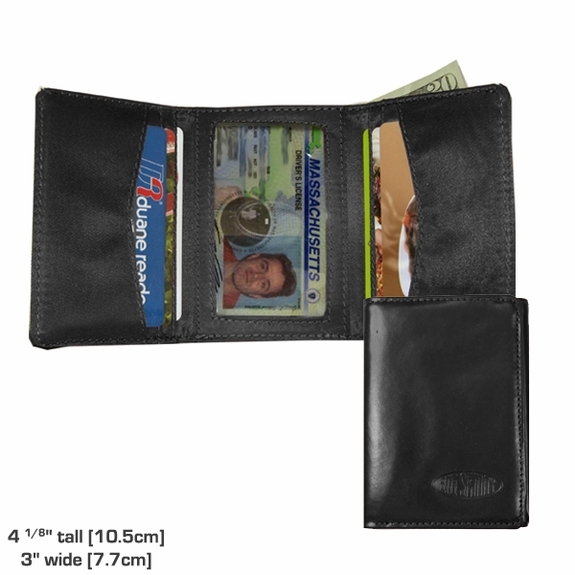 Because you are tri-folder for life, you won�t change and we won�t try to change you-- so here�s your thin tri-fold wallet that you just might like a lot�even with your 20-25 thick plastic cards filling it out nicely in the extra-wide pockets. Features: full-size billfold area 4 extra-wide credit card pockets 1 extra-wide clear ID/credit card pocket 2 oversized hidden storage pockets dimensions: 3" wide x 4⅛" tall (7.7 cm x 10.5 cm) only 5/16 (8 mm) thin when closed! We want you to be 100% satisfied with your purchase! You may make an exchange or receive your money back [less shipping/tax] for your UNUSED item within 30 days of purchase. During the December holidays, we extend the return policy to 60 days, since we know many of these purchases are gifts. Just ship back to us with packing slip and instructions for exchange or refund. I have to pat my back pocket throughout the day to make sure it is still there. this was a gift to hubby. He has a nylon one and is thinking the money might "bunch up" less with a bit firmer outside. The wallet is exactly as described and at the sale price it's a very good value. ConsHad a question and the condescending, arrogant attitude of "customer service" was amazing (as in amazing horrible). First Buffed Leather item; first time using a trifold. In response to an otherwise no compromise excellent wallet- my original problem with my big skinny bifold was that it wasn't tall enough to hold my receipts without ruffling. Additionally it doesn't hold EU/British bills well when I lived there for a year. So in compromise- I found the taller trifold! It worked! the wallet holds everything in with the taller frame. Buffed leather exterior allows smoother slide in into my pants pockets. And the feel of the texture on my fingers? Simply amazing. Here is the caveat... The Trifold design cannot hold the same number of cards (from the bifold) without the outer flap bending out. It cannot stay flat. In fact... you would almost need to put just 1 card in each slot for the trifold to lay flush. This beats the purpose of why I have been a happy customer of bigskinny- having their wallets able to hold ALOT of cards while staying flat. Otherwise... every other build and construction is as great as my original bigskinny bifold (which looks a month old despite 3+ years). So... 4 stars. Where else can you buy a quality leather wallet for under $30.00? Looks good, feels good, does the job well. A great value. Thanks! ProsLooks good and feels good in the back pocket. This is my second big skinny trifold and as long as the quality remains the same I will continue to purchase Big Skinny Trifolds. It is all it is said to be. Overall I think the slenderness of the wallet. Slim wallet beats predecessor by wide margin! Received the Buffed Leather Tri-Fold quicker than expected even for Xmas week. I quickly removed the stuff out of my old wallet, and transferred it over the Skinny. With the direct transfer, the Skinny was thinner than my old, very worn, wallet when empty, but the length & width was a bit bigger. The bigger foot print came in handy as my old wallet did not accommodate my Wisconsin state hunting license with out and extra fold but the Skinnys back slot tucks it away out of sight. The center clear ID slot works great and easily hold the three ID cards I carry, and they can be removed with ease! The one thing I was worried about was the depth of the card pockets, and how easy it would be to remove the cards for each use. It has taken some time to get used to, and it still takes a bit more dexterity, but it is not all that bad. Overall the wallet has been great and with a very nice feel and the price was right. I hope I get many long years out of it. Great wallet. Lean and mean, but holds all of my things. I'd like to see it with an eelskin or alligator print. That would make it more elegant. Big Skinny Corp., 2004 - 2018.  © All Rights Reserved. Nothing on this website may be used or reproduced without permission from Big Skinny Corporation. Yes, our Harvard-trained lawyers are litigious-loving gunslingers so don't mess with Big Skinny.